To begin with a Storyboard Notebook with space pre marked for a ‘Video frame’ and the ‘Description/VO/VFX’ is a very useful product proposition. Probably comes from the fact that the creative bunch in advertising often use Moleskin notebooks. Story boards for Audio Video communication is often scribbled on sheets of paper. To offer a product that eases the need of the creative mind at a marginal increase in cost to the company. Fantastic! And how would you promote this in store? The brilliant fushia pink does its job of getting attention. The simple shelf message stating the product benefit holds attention. 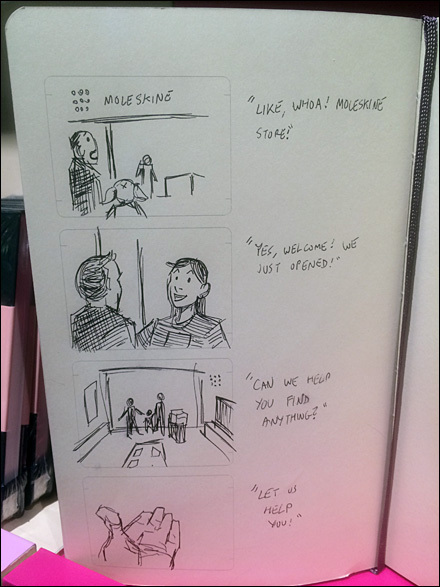 1) convey the product benefit by a hand drawn actual story board 2) highlight the customer experience in a Moleskin store – where the staff greets customers and helps them navigate the store. Attract. Engage. Call to action combined with Customer Experience! Now that is fantastic Shopper Marketing. This entry was posted on March 5, 2014 by thebuystories in insights, Shopper Marketing and tagged customer experience management, moleskin in store communication, Moleskin notebooks, Moleskin store, Moleskin Storyboard Notebook, Shopper Marketing, Story boards.